Proprietary Name: Higher Education Spring Break Oil-free Broad-spectrum Sunscreen Spf 30 What is the Proprietary Name? Non-Proprietary Name: Higher Education Spring Break Oil-free Broad-spectrum Sunscreen Spf 30 What is the Non-Proprietary Name? 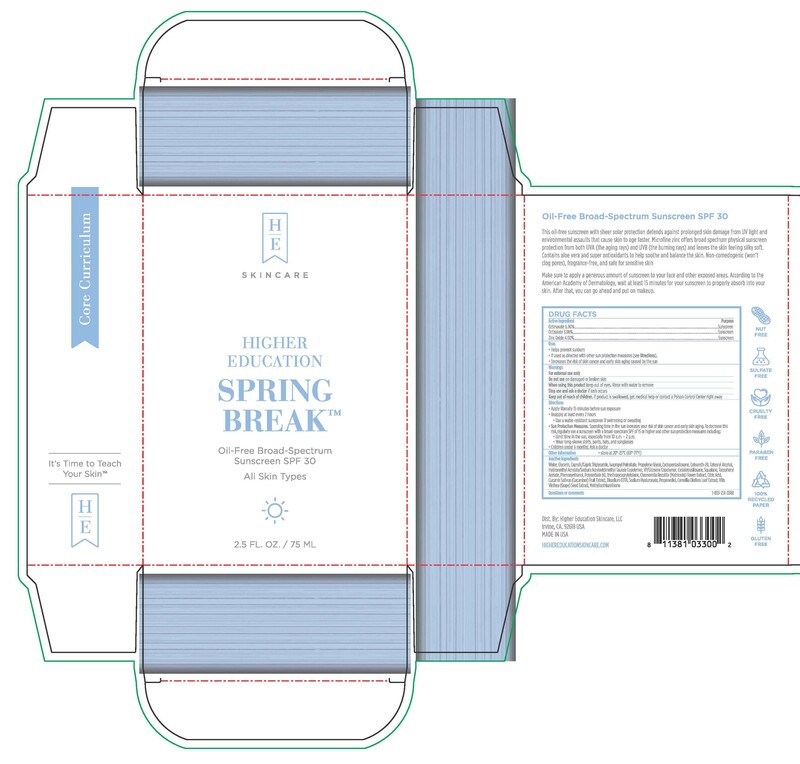 Higher Education Spring Break Oil-free Broad-spectrum Sunscreen Spf 30 with NDC 72936-010 is a a human over the counter drug product labeled by Higher Education Skincare, Llc. The generic name of Higher Education Spring Break Oil-free Broad-spectrum Sunscreen Spf 30 is higher education spring break oil-free broad-spectrum sunscreen spf 30. The product's dosage form is lotion and is administered via topical form. Keep out of reach of children. If swalled, get medical help or contact a Poison Control Center right away. Aqua/Water/Eau, Glycerin, Caprylic/Capric Triglyceride, Isopropyl Palmitate, Propylene Glycol, Cyclopentasiloxane, Ceteareth-20, Cetearyl Alcohol, Hydroxyethyl Acrylate/Sodium Acryloyldimethyl Taurate Copolymer, VP/Eicosene Copolymer, Cyclotetrasiloxane, Squalane, Tocopheryl Acetate, Phenoxyethanol, Polysorbate 60, Triethoxycaprylylsilane, Chamomilla Recutita (Matricaria) Flower Extract, Citric Acid, Cucumis Sativus (Cucumber) Fruit Extract, Disodium EDTA, Sodium Hyaluronate, Propanediol, Camellia Oleifera Leaf Extract, Vitis Vinifera (Grape) Seed Extract, Methylisothiazolinone.